Carrickview Cottage is your own separate accommodation nestled in a rural/orchard setting. Enjoy privacy, relax with your complementary bottle of wine, read by the frog pond, or visit local attractions. Nestled in the heart of historic Mt Pisa Station you have a choice of two cosy self contained cottages dating back to the 1860's, which sleep 4-5 people. Luxury Orchard/Farmstay set in landscaped gardens and grounds. Brand new studio unit with quality furnishings and private raised deck overlooking garden. Bridesdale cottage is yours exclusively and is warm and sunny with great mountain views. Our friendly welcoming Bed & Breakfast Homestay accommodation is ideally situated in centre of Wanaka, just 5 minutes WALK to Lake Wanaka and the Town Centre. Windermere Farm and English Language School is just 8km from Wanaka and the lakeshore, on the main route between Mount Cook and the West Coast. 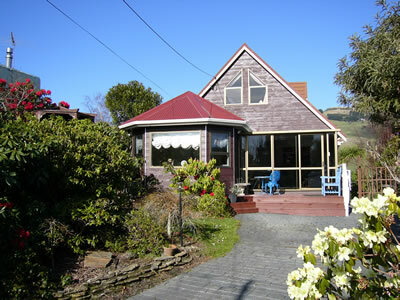 Luxury accommodation on shores of Lake Dunstan in the centre of the wine district. Magnificent views. A new property offering quality bed and breakfast set in quiet spacious landscaped garden with superb mountain and lake views. Walking distance to town centre. A farmstay experience. Up close and personal with livestock (horses, sheep, cattle) blended with food and hospitality. Country homestay close to Cromwell, almost surrounded by a working orchard. Beautiful mountain views and glimpse of lake. A secluded home with superb views and complete privacy assured, but conversation also enjoyed. Alexandra is only 5 minutes away. The lodge offers you sociable, informal, home-from-home style accommodation where you can relax in comfort, and enjoy the sensational view of Black Peak. We welcome our guests to a spacious sunny, self-contained upstairs suite complete with kitchen. Close to the rail trail and the Alexandra town centre. Two double bedrooms look out over magnificent views. Our architecturally designed house has two spacious bedrooms and 360 degree views of the lake and mountains. Tucked away off the Crown Range Road, our local stone built home offers our guest comfort, style, north facing sun, log fires within an acre of mature gardens. Nestled in the high country mountains beside Lake Wanaka is the "Rocks of Roy".